The countless miniscule buggies I saw swarming in my tank are gone. The fish and shrimp ate them all up. They lasted less than a week. I hope the girls learn to get used to manufactured dry food going forward. This morning I turned on the light and my fish were asleep and so were the shrimp. They were all lolling about on the bottom of the tank. The two sisters were sleeping on the log. When the lights came on, one shrimp jumped. After a moment, the two fish slowly started to move about. I also saw shrimp shell remains from a molting the night before. Yesterday when I tried to feed the fish, they ate and spat out brine shrimp flakes and also ate and spat out freeze dried bloodworms. I suspect they were raised on live foods as fry in the hatchery so they don’t know how to eat non-live food. So far, they’ve been living off the buggies swimming around and algae but I can see there isn’t much of either left in the tank and eventually they’re going to have to eat the food I offer. I finally got some animals to put in my planted tank! 2 female American Flagfish which I’ve named Buttercup and Daffodil. One has a dot on its dorsal fin (Daffodil) and the other one does not (Buttercup). And 10 ghost shrimp. When I came back from the cruise, I noticed there were tiny little specks of buggy looking critters swimming around the tank. Tons of them! I think they might have been eating algae because the once-growing patch of algae on the glass was shrinking. So when I released the two girls, you can imagine their excitement. They were feasting on the buggies. I’m not sure if they’re daphnia. I think they’re too small to be… Maybe they’re ostracoda or copepods. The shrimp started looking for food around the plants too. I’m not sure I’ll need to feed them for a while. That’s the nice thing about having a planted tank. It’s almost self-sustaining. Before introducing the animals to the tank, I tested the water’s ammonia levels first. 0. Good. It better have been 0 since I’ve had this tank running for almost 3 months. It would’ve been smarter to test the water before bringing any animals home because otherwise I’d have no plan B of where to put them. But I sort of assumed my water was clean because of the little buggies thriving in the tank. It’s generally a sign of clean water. Next, I floated the bags of fish and shrimp into the tank to get them used to the temperature. After 30 minutes, I drained some of the water out of the bags containing the animals into a discard bucket, and added a little of my tank water into the bag. Another 30 minutes later, I again discarded some of the water in the bags, and replaced it with more tank water. Another 30 minutes, I put the fish and shrimp into the tank, trying to keep as much of the the bag water from going into the tank as possible. I watched them for a few minutes, hunting for food, and then I turned off the lights. In the future, I hope to maybe get cory cats, but I’m probably going to wait a while to see how well everybody settles in before doing that. The last time we replaced our bathroom faucet was in October of 2013. And it’s broken again. We should probably take responsibility for breaking it though because we take the faucet part off monthly to attach a water filter to fill a reservoir for our saltwater fishtank. It causes a lot of wear and tear on a sink attachment that normally is left alone indefinitely. So we’re probably going to have to think of another way to fill the reservoir for the fish tank. In the meantime though, here we are again – in the market for yet another bathroom faucet. I had no issues with the Moen faucet. Loved it in fact – it worked nicely. The plumber liked it. But eh, what the heck, I’ll give the Grohe faucets a whirl. I guess it doesn’t really matter since they all look very similar but if anyone has an opinion, share! I’m not against sticking to the Moen again either. People are outside in shorts and t-shirts today. I saw cherry blossoms starting to bloom on Christmas. I have the windows open to cool our place down a bit. It’s been an unseasonably warm winter. If it wasn’t for the very short days, I’d say this was mid-Spring. We just got back from our first cruise ever! Verdict: Pretty good. I’m not in a hurry to do it again, but I wouldn’t dread it if we were to do it again (preferably with others, it’s a good group/family activity). Going in, I was a little hesitant about it because cruises, Caribbean beaches (touristy), just don’t sound like they have much by way of experiencing different cultures and foods which is what I generally like about travelling. Even for local/domestic travel, it’s nice to experience the local rhythms of a town. I won’t say I was wrong about my hunches. It is very touristy. It is crowded, being on a big boat with a lot of people everywhere all the time. Aboard the ship, it is devoid of local cuisines. Think Bob’s Big Boy or Cheesecake Factory food. But it was still fun. Cruise ships are decadence, gluttony, waste. Even though the food wasn’t wonderful, it wasn’t bad either and I spent a lot of time eating, 6 square meals a day! Food was available all the time. It’s always nice to not have to cook or clean for a few days. So that was the ship experience. With regards to the Bahamas, I love the beaches and would love to go back (said with a little afterglow of the sun). The beaches in the Bahamas were the most beautiful I’ve ever seen and they weren’t too crowded either. I would probably go by plane though and stay a few days instead of a cruise. The soft sand and beautiful blue waters… it was spiritual! I was more relaxed than at any yoga class. I learned that I actually do like beaches afterall. Sunshine is glorious! I love fall squashes. When the season comes around, I always end up buying 2 or 3 at a time and then woefully regret my greed when I’m hauling them home because they are heavy. Stir fry the onions, garlic, and salt in oil for a few minutes. Simmer until the squash is soft. This here is my Pot of Propagations. I’m not sure how I will separate the plants after they’ve settled in here because their roots will probably tangle in the soil. My thought was, I will just propagate more if I want them in individual containers. 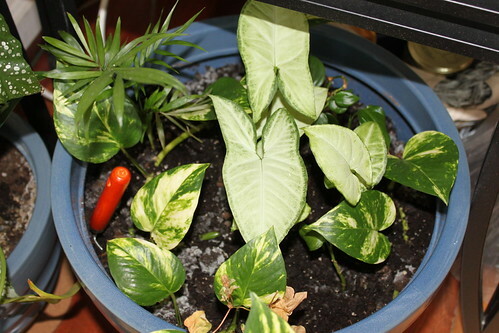 I don’t think I have the space anyway for a bunch of separate pots because I’m greedy for new plants all the time. 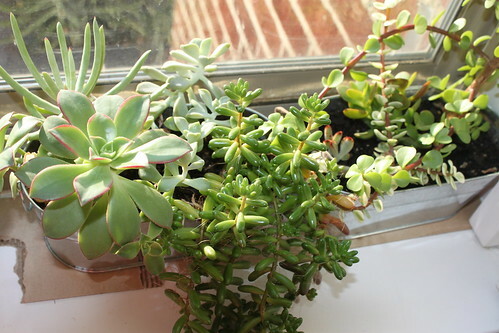 This is a more efficient way to keep them all as long as their watering and lighting needs are similar enough. Remember this not-so-little-anymore begonia? It started as a 2 leaf stem cutting. It’s 4 ft tall now and has three stems. It has surpassed the zzplant as the tallest I have. Its’ been less than a year so maybe sometime next year, it’ll reach the ceiling. How tall do begonias get!? 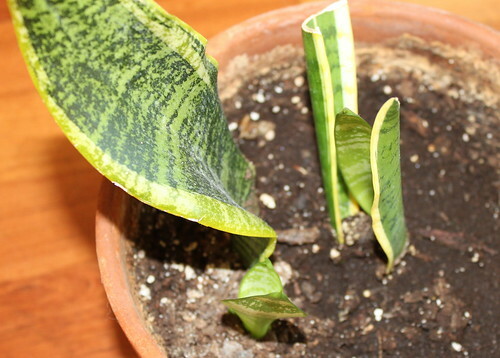 My two varieties of sansevieria are doing well. There are 2 leaves on each of the plantlets now. The succulents are growing out of their containers. Literally. Next Spring I will start propagating more if I can get my hands on more containers. This is how it all starts. An innocent looking, barely alive nubbin of a cutting. Every where I go, I am eyeing plants that I don’t have yet. I want a cutting of everything. 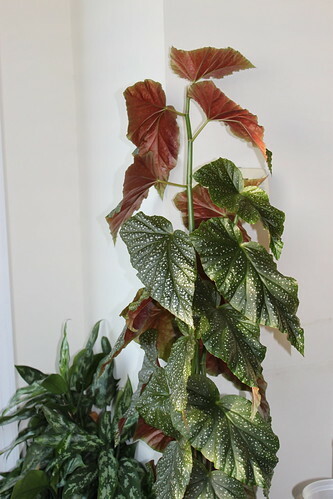 It’s the most rewarding to start a plant that way because the contrast is stark to go from a cutting to a 4 foot tall plant. Thankfully Christmas cacti are relatively small plants. 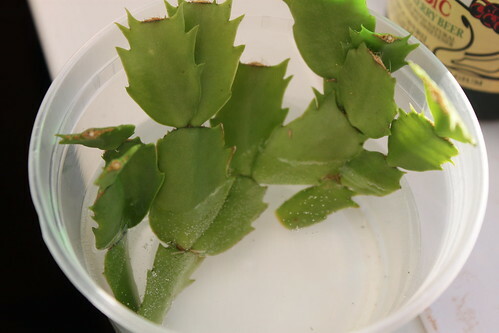 This will probably not go into the Pot of Propagations because it is a succulent and will need less water sometimes. 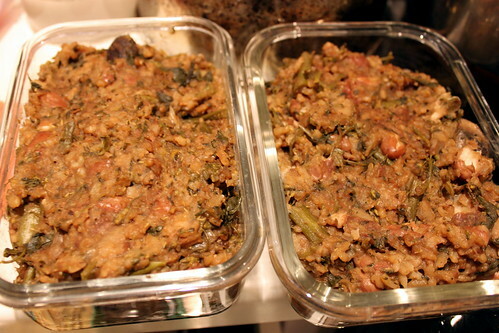 It’s rice, beans, parsley (too much of it), and mushrooms, and onions. It tasted like sod because I threw in an entire bunch of parsley. I can’t believe we ate this. The photo actually makes it look better than reality because of the flash, tricking the eyes with lighting. In reality it was brown. One big mass of brown blobby food. Awful. We went to Rehoboth Beach to do some post-Thanksgiving shopping this past weekend. I ended up getting just a bunch of kitchenware. Glass bowls! We keep breaking ours. I didn’t notice any great sales though. Old Navy was so picked through it was a big mess. I don’t generally prefer going online for clothes but I think you’d have better luck going online for that store at least. Maybe because it wasn’t Black Friday and the weather was drizzly and cold, but the crowds were pretty tame. If anything I thought the mall was rather empty.